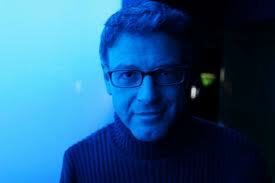 Pianist Pete Malinverni has a serious exterior — he’s tall and broad-shouldered and his black eyeglasses define his face. But that’s only a facade. Even though I’ve only met him twice, I see that his character is both spiritual and wildly playful: he has an impish, puppylike delight in the sensations around him. And it comes through in his music. That playful creativity is happily on display on his latest CD, A BEAUTIFUL THING! (Saranac Records 1009). The title refers to an original piece dedicated to his parents who are embarking on their fifty-eighth year of contented matrimony. 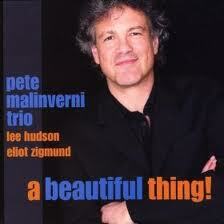 The CD is a trio effort — Pete is joined by old friends and jazz masters Lee Hudson, bass; Eliot Zigmund, drums. Now, I know that there are more than enough piano trios on the market implicitly clamoring for a listener’s attention. But Pete, Lee, and Eliot are masters of the form — they achieve a delicious synergy from the start, harmoniously. And the music is perfectly varied (most CDs grow burdensome because the artists tend to cram in too much of the same thing at once): this disc moves from multi-theme originals which recall piano and compositional styles across the jazz spectrum to lovely, pensive ballads (A HOUSE IS NOT A HOME), spirituals (GO DOWN, MOSES), standards (LA VIE EN ROSE and SWEET AND LOVELY) handled with sensitivity and originality. His compositions aren’t paper-thin superimpositions on familiar chord changes: EVOCATIVE and IN THE GARDEN OF THE ETERNAL OPTIMIST have their own identities: ringing lines and small musical surprises throughout. And the trio knows what it is to swing. When many jazz CDs by a variety of players turn out to be more-of-the-same, Pete’s new disc is a satisfying experience. Check out his website, www.petemalinverni.com., for the beautiful details.